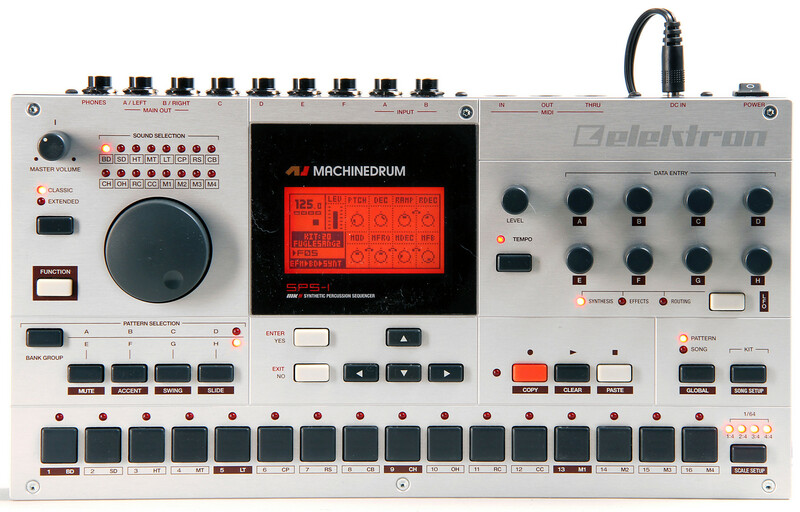 The creative goal of this project initially was to create a software emulator of an Elektron Machinedrum. The 16-step programmable interface is a legacy from earlier hardware drum machines, for a history of the development of the drum machine check out this Wikipedia article. While I have not replicated the user interface of the Machinedrum, I did manage to find samples of the sounds from it, these are included in the zip file containing the application and source code, found here. 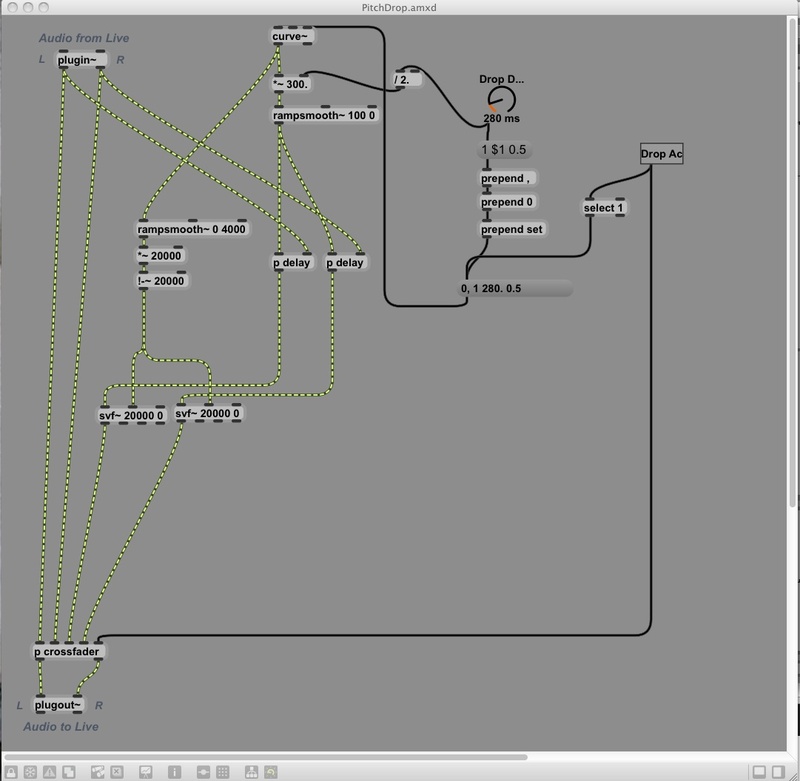 The technical goal of the project was to further my knowledge of Max and OpenFrameworks/C++. To get started open the “Start Machinedrum” application, this will launch both “MaxMachinedrum” and “OFMachinedrum”, make sure to wait until they are both open. Now drag and drop a sound file from the “Drum Sound Samples” folder into one of the “Drop sample here” boxes in the “OFMachinedrum” window. 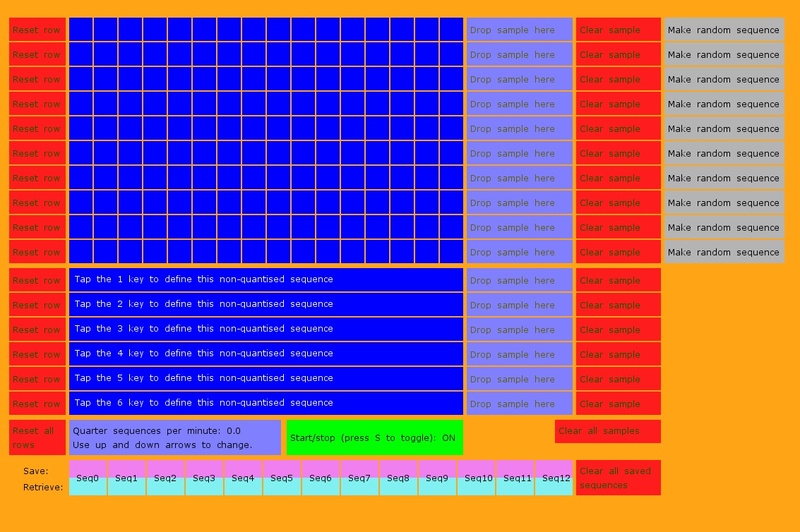 The first 10 rows are quantised, rhythms are programmed into these rows by activating the cells by clicking on them (yellow/green cells are active, blue/red cells are inactive). A random sequence can be generated in one of these rows by clicking on one of the “Make random sequence” buttons. The other 6 rows are for non-quantised sequences, to input a sequence in one of these rows drag and drop a sample into the appropriate ‘Drop sample here’ box and then tap out the sequence with one of the keys 1 to 6. Non-quantised drum triggers can also be set by clicking anywhere in one of the 6 non-quantised rows, and a single non-quantised trigger can be removed at any time by clicking on it. To reset a row, click on the “Reset row” button to the left of the row. To remove a sample, click on the “Clear sample” button to the right of the row. If you drop a sample into a box which already has a sample in, the old sample will be replaced. The “Reset all rows” and “Clear all samples” buttons do exactly what they say on the tin. The ‘s’ key starts and stops the drum machine, and the up and down arrow keys change the tempo respectively. The tempo is displayed at the bottom of the last row in quarter sequences per minute, a generic house track for example will play at around 120-130 quarter sequences per minute. I hope you enjoy playing with it as much as I enjoyed making it! 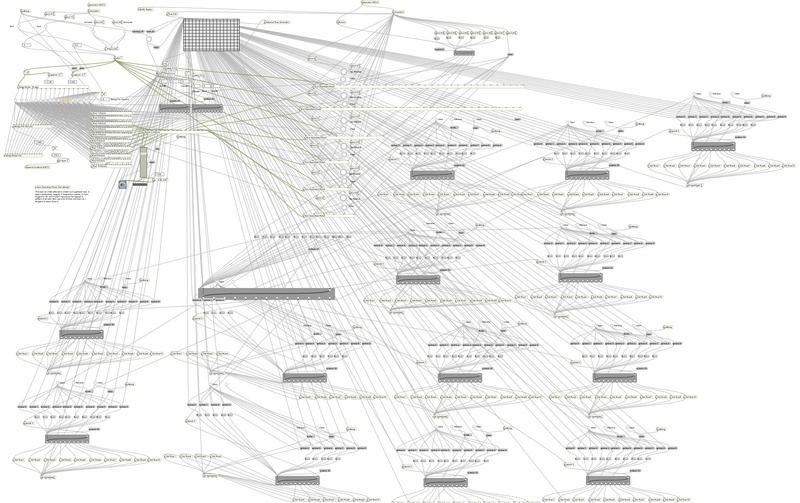 Max 6 and OpenFrameworks, were used. 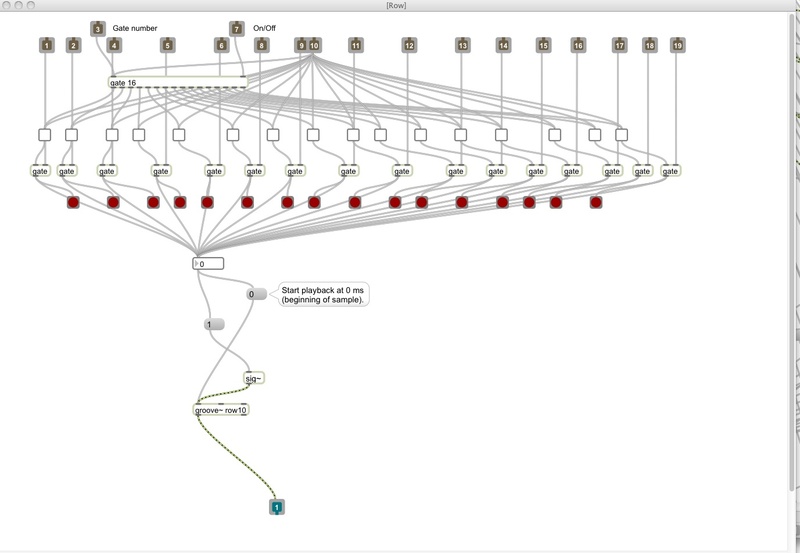 Max handles the audio processing and communicates with the interface built with OpenFrameworks using the User Datagram Protocol (UDP) for Open Sound Control (OSC) messages. The random rows are generated by the [p Random Row Generator] to the top right of the matrix. Here the non-quantised trigger information is stored in the [coll], this is given the messages “sort”, “renumber” and “dump” in that order at the start of every 16-step sequence. This is important as it keeps the triggers and their corresponding indices in the correct (ascending) order. The technical knowledge of these creative coding tools that I have gained via this project should be useful when it comes to my final Masters project. 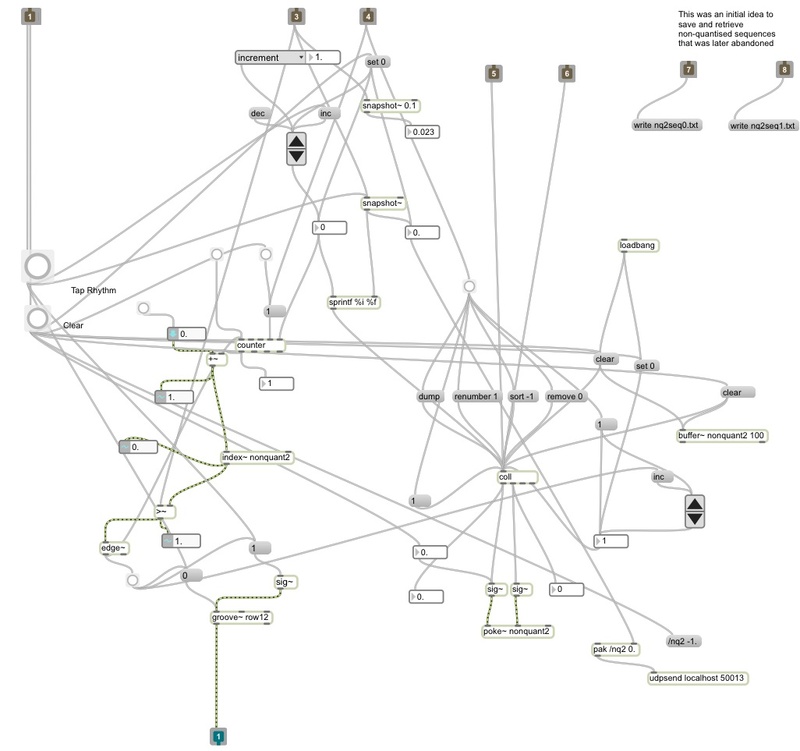 In particular having now had experience of getting Max and OpenFrameworks to communicate with each other using OSC messages will open up a myriad of possibilities for project ideas. The aforementioned issue with regards to retrieving saved patterns is one that certainly needs addressing. 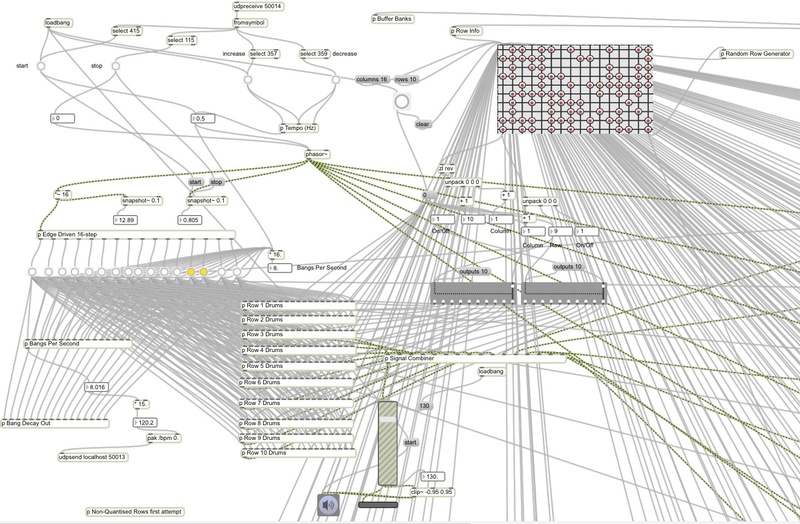 – The following OpenFrameworks example projects were used for inspiration/manipulated/adulterated/ripped off; oscReceiveExample, oscSenderExample, dragDropExample.